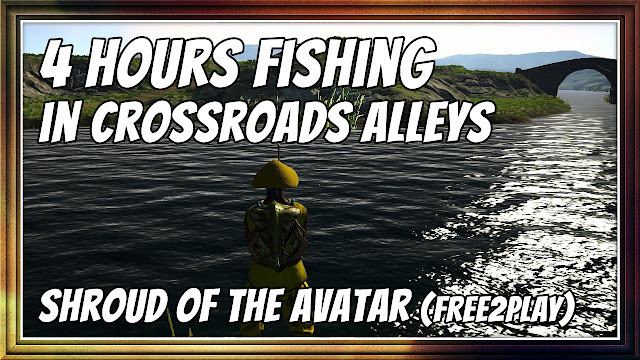 4 HOURS FISHING IN CROSSROADS ALLEYS • SHROUD OF THE AVATAR R60 (FREE-TO-PLAY) - KABALYERO - PLAY, BLOG & EARN! 4 hours fishing in Crossroads Alleys to catch the biggest fish for the Titanforge's Monster Catch Fishing Tournament. I spent all my time during the big fishing tournament in Crossroads Alleys. I was trying to catch the biggest fish because the prize for the biggest fish was a Taxed POT Row Lot Deed. In this four hours, I was able to catch a King Salmon with a fish length of 2.4. Is it the biggest fish? I have no idea. I will find out when the winners are announced. I wanted to win the Taxed POT Row Lot Deed because I wanted to use it on a Row Lot and place a Greenhouse Rowhouse on it. Right now, I'm using Greenhouse Rowhouses on Row Lots to grow or farm plants in Shroud of the Avatar because the tax on a Row Lot is very, very cheap. I'm not sure if I'm going to win but it was a blast just trying. LOL!